Midtown In Motion - KLD Engineering, P.C. Midtown Manhattan is characterized by a closely spaced signalized Cartesian grid systems of one-way streets, with short blocks (approximately 200 ft.) along the avenues, and long blocks (approximately 500 ft. or longer) along the cross streets. Substantial traffic demand exists due to the extremely heavy concentration and diversity of activities in this area. Vehicular traffic is often mixed with heavy pedestrian volumes, while intersection spillback arising from overflow queues is frequent, especially in the vicinity of business activity centers. KLD developed an innovative approach to addresses traffic congestion from both demand and supply sides simultaneously. Various demand regulating strategies, depending on the prevailing congestion levels are applied at the peripheral roadways of the target control zone. These strategies proactively employ signal offsets and splits to exert a tapering and rebalancing effect on the traffic, for the purpose of better utilizing available network storage spaces while preserving the capacity of the target control zone. Inside the target control area, a dynamic queue balancing strategy is implemented at selected critical intersections to prevent propagation of spillovers with stabilized or diminished queues. 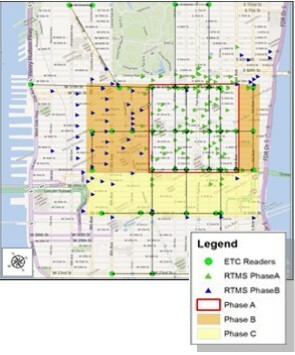 The control area has been incrementally expanded to a zone spanning from 1st Avenue to 9th Avenue and from E 57th Street to E 42nd Street, inclusive. Large-scale per-trip travel time data (nearly 1 million records daily), collected by roadside ETC tag readers, and traffic volume and occupancies data are analyzed in real time for generating demand regulating signal control strategies and adaptive signal timings for over 200 ASTC controllers. Extensive analysis of large scale data sets was completed and initial results show an improvement in speed of around 10% within the congested study area.